Following multiple discussions on Twitter and in the DCUK forum, and at last a welcome session on Diabulimia at the Diabetes Professional Conference (DPC) in Glasgow on Tuesday, it appears that Diabulimia is starting to get wider recognition in the healthcare sphere. But as discussed in my last post, there is much more to T1 than many people consider, and one of the biggest psychological aspects of it is the sudden requirement to be obsessed by food. And I can’t say that is an understatement. If we take a step back, the standard regime of MDI requires that each and every T1 learns what (at a minimum) the carb count of food is and therefore learns how to manage their insulin in relation to this, as our bodies no longer do this for themselves. In reality, we should really be looking at the Glycaemic effect of food rather than the carb count, but those providing education in diabetes-ville are only just starting to realise that people really do want this and that it’s hard to achieve simply. But if you take the way that people with diabetes should read labels, weigh foods, calculate carbohydrate values, work out the glycaemic load and generally be required to obsess about the food they eat, looking in from outside, knowing nothing of Diabetes, you might consider that it looked a lot like an eating disorder. The same could be considered true of a number of other long term chronic conditions. The sad fact is that anything that this is yet another area that is ripe for psychological issues. If you are the slightest bit likely to have issues with food, then T1D opens up the trapdoor to various circles of hell that most of us wouldn’t want to go near. In fact, research shows that Type 1 Diabetics significantly more likely to suffer with an eating disorder than non-diabetics. Numbers bandied around suggest up to 250% more likely, which is a huge issue. And that brings me on to Diabulimia. A particularly vicious circle of hell. I’m not going to pretend to be an expert on Diabulimia and I would recommend reading the Diabulimia Helpline website if you need more information. This can only ever be a primer and an awareness raiser. Diabulimia is considered an eating disorder, and it is the omission of insulin in order to lose weight. It’s absolutely a body image and psychological problem. At the session on Diabulimia yesterday at DPC, only 25% of people in the room knew what Diabulimia is. This is an audience predominantly made up of Diabetes healthcare professionals. That is a scarily small number. Diabulimia historically has not even been recognised as a medical or psychological problem. 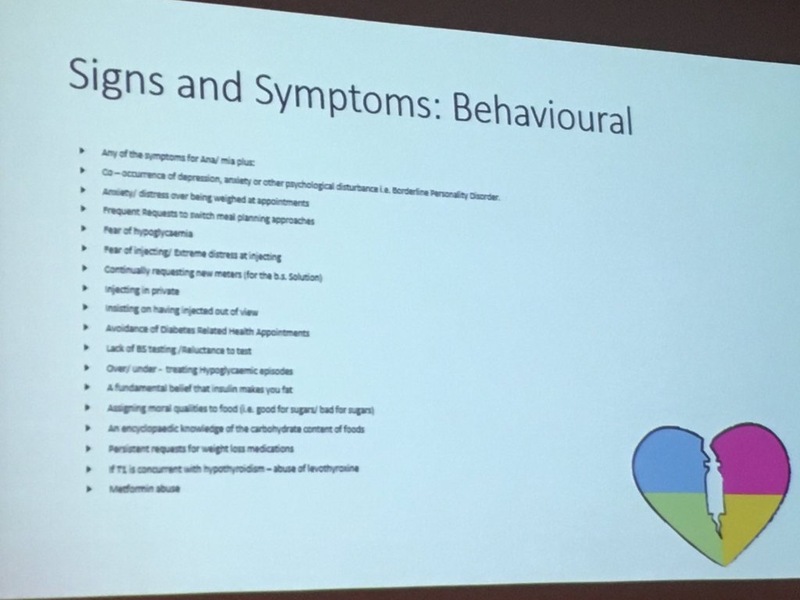 In many cases, Diabulimia is simply mistaken for non-compliance with the treatment programme that is supposed to be in place, and looking at the slide below, it is easy to see why (apologies for the poor quality, it is a smartphone image of a conference slide). Diabulimia is manifested at its most basic as not taking insulin, running a high to very high blood glucose level, and as a result, losing weight. It’s often considered to be something that is seen in 15 to 30 year old women, but the reality of this is somewhat different, as it affects both men and women and at different ages. I have seen instances of people appearing on the DCUK forum that were overweight men clearly suffering diabulimia. They persisted, in spite of the risks, fully aware of the risks, because they were losing weight. It may be a much wider problem than is currently recognised. There are a number of facebook groups that were originally set up as peer support groups for those suffering, yet also provide a mechanism to share ways of continuing to practice. The techniques get very sophisticated, as is often the case with eating disorders. In order to avoid the risk of DKA, sufferers will take as little insulin as they can. This is enough to avoid the situation where they end up in A&E, but little enough to maintain a level of DKA where they continue to lose weight. It will generally be well hidden. There are obvious enormous risks with doing this. Early onset of diabetic complications associated with hyperglycaemia is obviously an issue, and a very uncomfortable and painful one. But the reality is that DKA is a much bigger and more deadly immediate risk. If you are running in the borders of DKA, one step in the wrong direction and hospital beckons. Hair loss Delayed Healing from infections/ bruises. Co – occurrence of depression, anxiety or other psychological disturbance i.e. Borderline Personality Disorder. Many of these are also symptoms of pre-diagnosis T1D and this is potentially a way to spot it. Sadly, some of the aspects above are also totally normal behaviour. Many T1s consider foods to be good or bad for carbs and have an encyclopaedic knowledge of carb content in foods. If you spot diabulimia, either in yourself, or in a friend or relation, you’ve only really a couple of options, and that’s to raise it with their care team if you know who they are, or with the individual themself. The latter route is fraught with the same dangers that any eating disorder has. As I said earlier in the blog, I’m no diabulimia expert, but I feel that its a topic that needs to be recognised more widely, so this post is simply to try and make more people aware. Thanks for reading!